Northern bobwhite (aka bobwhite quail) is ground-dwelling bird that once was an abundant and commonly hunted game bird. Quail are shrubland birds and their habitat is composed of grass, forb, and shrub cover. Quail are social birds that gather in groups called "coveys.” From fall through spring, as many as 10 to 30 birds may form a covey in which they forage and roost closely together. In the early spring, coveys break up and individual birds mate, nest, and raise broods through the summer. Quail habitat requirements change seasonally. Dense patches of shrubs provide critical places for birds to escape from predators and find shelter from harsh weather in the winter. Bobwhite seek out areas of lush herbaceous groundcover (grasses and forbs) in the spring, though shrubs and other woody understory plants remain critical as places to escape from predators. An abundance of quail can be found in areas of early successional vegetation such as that present after tillage, burning, or timber harvest. Quail most often use these areas for 3 to 4 years after the disturbances. Eventually though, woody plants grow tall and shade out herbaceous plants, eliminating habitat for quail. Quail are primarily seed eaters, although their diet covers a wide range of plant and animal matter. Small hard mast, weed seeds, tender leaves, fleshy fruits, bugs, insects, and snails are the primary foods consumed throughout the year. A mixture of shrubs, including blackberry, and areas with grasses and forbs provides year round cover for bobwhite. Cover typically is the limiting component of habitat on most properties, so it must be emphasized in efforts to create and maintain quail habitat. Foraging cover typically is characterized by bare ground with an “umbrella-like” cover of forbs overhead. Quail forage by searching the ground for seeds, fruits, and animal matter. Areas with dense ground cover or litter will not be used by quail. Nesting cover must have forbs or grasses with patches of shrubs nearby. Quail often nest along fencerows and the edges of farm fields, but more extensive nesting cover can be created and maintained by frequent (every 1 to 3 years) soil disturbance to promote forbs, including goldenrod, dogfennel, ragweed, and horseweed. After courtship in the spring, quail build nests by scratching a depression in the soil. The nest is lined with dead vegetation and concealed by forbs and grasses. Bobwhite clutch size averages 12 to 14 eggs. Either the male or the female bobwhite may incubate eggs and raise the brood. In fact, an individual female bobwhite may mate with several males during a season, leaving each male to incubate the nest and raise the young chicks. Escape cover includes woody understory plants, including shrubs and blackberry thickets, to hide from predators year round and to protect themselves from weather extremes. In the winter months, quail seek out these areas to stay dry and warm. In the summer months, quail seek out these areas to find shade and stay cool. Surface water is not essential. Quail get moisture from dew drops, rain, snow, succulent leaves, fleshy fruits, and insects. In high quality habitat, the home range of quail is about 40 acres per covey. Over 75 percent of adult quail have a lifetime range of 1⁄2 mile or less, but individual birds often move up to 1 mile in the spring following covey breakup..
• Don’t waste your time managing for quail in a small area unless surrounded by areas with extensive habitat. Bobwhite require many hundreds of acres of relatively connected habitat. • Create and maintain extensive areas of grass, forb, and shrubs in close proximity to one another. 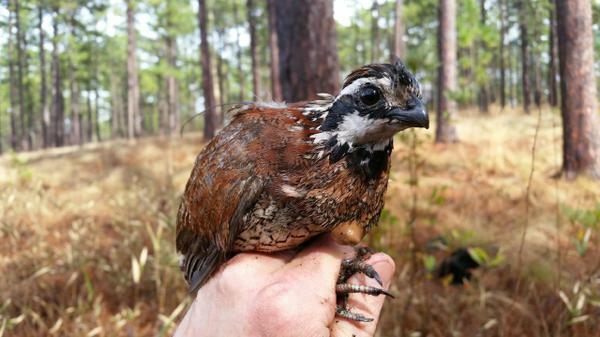 • Dense forest, pasture, and urban areas all are unsuitable for quail, so avoid managing for bobwhite in these areas. • Thin forest stands frequently and to a relatively low number of trees per acre. • Favor wide tree spacing in plantations to allow sunlight to reach the forest floor for an extended period of time, which promotes the forbs and grasses used by quail. Spread regeneration cuts across the landscape to maintain dense escape cover. Favor oak species that produce smaller acorns. Limit tree cover by thinning and conducting prescribed burning. Frequently burn to renew herbaceous vegetation and limit development of trees. Use burns to maintain vegetation in an early succession stage dominated by forbs, grasses, and shrubs. Kill non-native pasture grasses, such as tall fescue and bermudagrass, with herbicides to release fallow vegetation that provides habitat for bobwhite. Avoid excessive mowing, especially late in the summer when there’s too little time for vegetation to regrow before the winter. Late season mowing leaves vast areas devoid of habitat throughout the winter. Leave borders of fallow vegetation along cropland margins and along the banks of drainage ditches and streams. Plant annual and perennial food plots after larger scale habitat restoration efforts (as described above) have occurred.